Not all ice sheets are the same! Everybody knows that Earth has magnetic properties and has seen a compass needle moving towards the north. It’s due to the fact that Earth acts, in first order, as a giant bar magnet. Earth produces a magnetic field that extends from the interior of Earth out into the space. 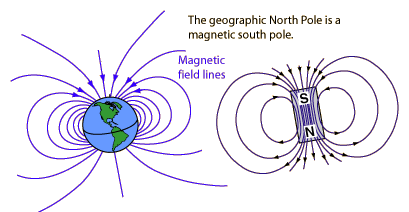 The magnetic field of Earth can be described at any location on Earth. 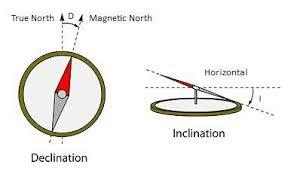 The angle of this magnetic field relative to geographic north is called declination (D), like when you use a compass. The angle between the field and the horizontal is inclination (I). The inclination is positive when it points downward into Earth and negative when it points upward out of Earth. The strength of the field, which we refer to as the intensity, also varies with time. But what does this have to do with rocks? When clays, silts, and sands are deposited on the seafloor, some minerals with magnetic properties (usually minerals that contain iron) align with the direction of the magnetic field of that moment. Over the course of time, these sediments are buried, but they can record the magnetic field that was present at the moment of their deposition. Why is it interesting to have minerals able to register the Earth’s magnetic field? A key point of interest is that throughout geologic times Earth’s magnetic field was not always in the same direction as today. At irregular intervals, it abruptly switched: the geomagnetic north pole became the geomagnetic south pole and the geomagnetic south pole became the geomagnetic north pole! This process is called geomagnetic field reversal. The geomagnetic field currently points to the north and downward in the Northern Hemisphere and to the north and upward in the Southern Hemisphere, like that shown in the figure below. This is considered to be “normal” polarity (the same as the present day). 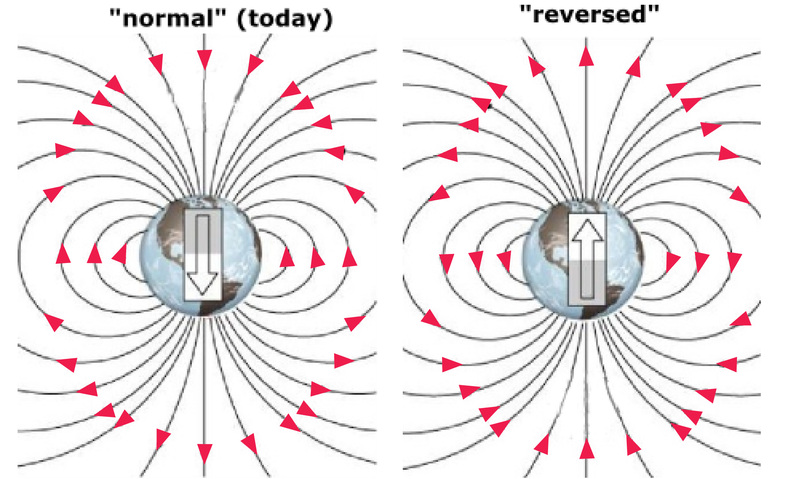 When the field switches, it is “reversed” polarity. Sediments have recorded these switches. 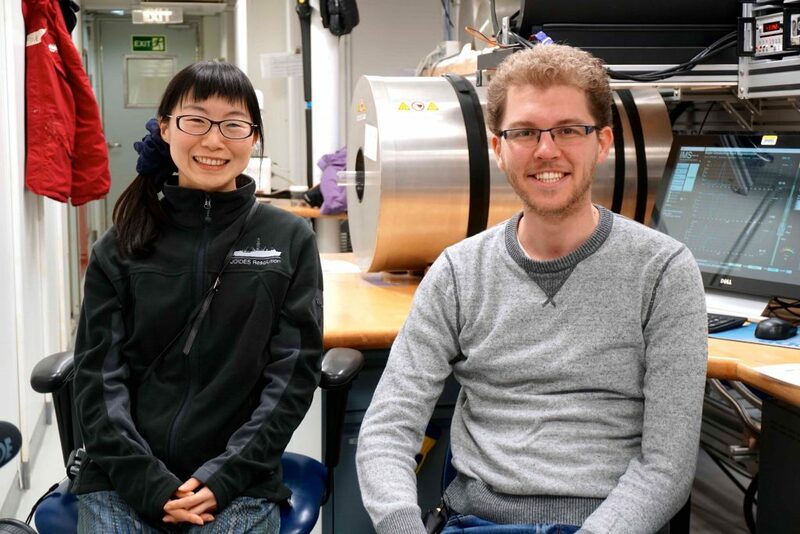 Our two paleomagnetists on board (Tim and Saiko) are looking at the sediments we are coring to know if the Earth’s magnetic field was normal or reversed during deposition of the sediments. 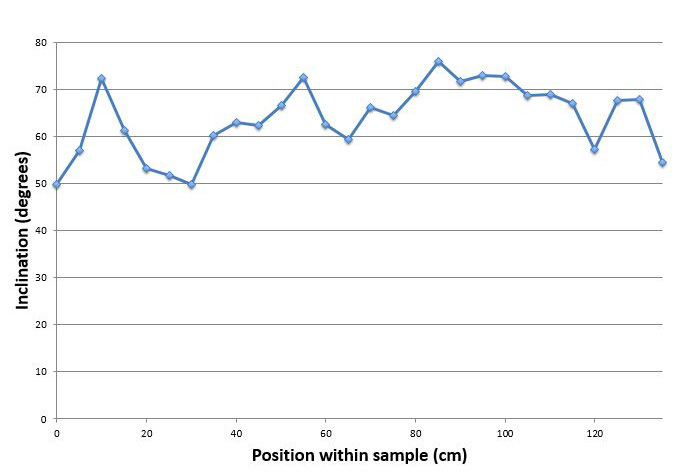 Why is it useful to know if the sediments have registered a normal or a reverse polarity? Scientists, including paleomagnetists, have developed a time scale that includes the history of Earth’s geomagnetic field reversals. This time scale assigns an age to these different events. Therefore, paleomagnetists can use this time scale to figure out when rocks with different magnetic directions (normal or reversed) where deposited. Using this method (and with a little help from our paleontologists onboard), Tim and Saiko are able to give us an age for the sediments, which is pretty cool because it’s always a crucial question to know when something has happened! 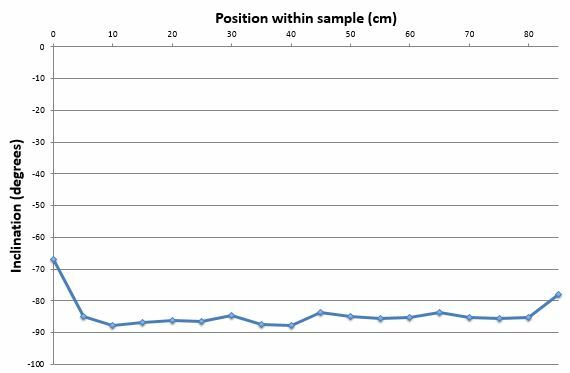 These are two measurements made by Saiko and Tim on two different samples collected during Expedition 374. One corresponds to normal polarity and the other to reverse polarity. But which is which? – The blue line is the measurement of inclination. – We are drilling very close to Antarctica (Southern Hemisphere)! Agnès is a French high school teacher with a passion for sharing geological sciences.